Comments: Armed with blaster rifles and dressed in black armor designed to increase sensor-stealth, shadow stormtroopers loyally serve a mysterious agent of evil named Carnor Jax and obey Jax's order to eliminate an Imperial Guardsman named Kir Kanos. 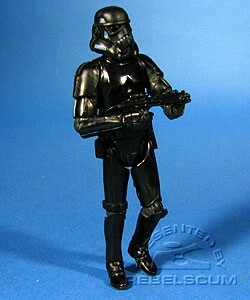 Shadow Stormtrooper is a repack of 2006's exclusive TSC Shadow Stormtrooper. This figure was the one of the figures chosen by fans as the winner of the Saga Legends Fan's Choice Showdown in the fall of 2007. Also included with this figure is an offer for an exclusive Captain Rex figure from The Clone Wars.